Email alerts in the form of desktop notifications is more handy way to stay updated with your email account activity. There are number of third party programs that allow new email message and chat conversation alerts on your desktop screen. If you use Google Chrome as default browser, then there is no need for additional program for Gmail desktop notifications. Just setup following to get going with new email alerts of your Gmail account on desktop, powered by Google Chrome browser. 1. Open Chrome browser and then login into your Gmail account. 2. Click Settings at top right part of the screen. 3. Under the ‘General’ tab look Desktop Notifications option. Then click option “Click here to enable desktop notifications for Gmail”. 4. Further you can customize to set either email notification or chat notification or both type of notifications for your Gmail account. 1. Checkout collection of Gmail notifiers for Windows & MAC. 2. 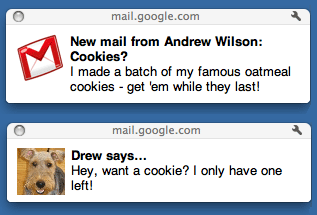 Gmail alerts in Growl style for added polish. 3. Gmail alerts for multiple accounts using same program.